In practical life, the numbers of motors are used for different applications. According to the application, speed control is required. For speed control of dc series motor, various methods are used that we will see in this article. 1 How to control the speed of dc series motor? How to control the speed of dc series motor? Dc motors are generally available in three types: Dc series motor, Dc shunt motor, and Dc compound motor. The main advantage of dc motor is that we can control the speed of dc motor in a wide range. In a flux control method, we change speed by varying flux per pole. In the Armature control method, we change the armature resistance which gives a change in speed of dc series motor. If you want to know in brief read completely. In the series motor, the variation of flux can be brought about by diverting the current flowing through the series field winding by any one of the following methods. Field diverter method is one of the methods for speed control of dc series motor by changing in flux. A figure is shown below. In this method, resistance is attached in parallel with the series field winding. 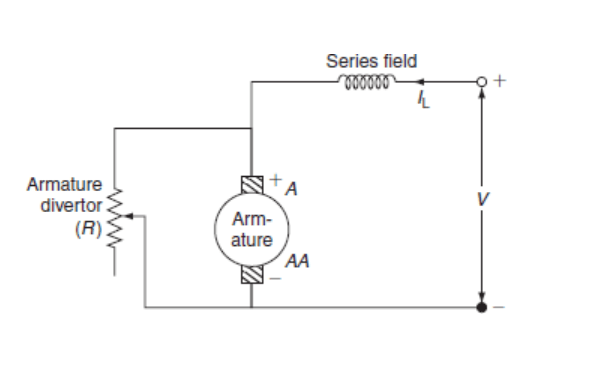 Any desired amount of current can be passed through the diverter by changing its resistance. Hence, flux will be change and we can control the speed of the induction motor. 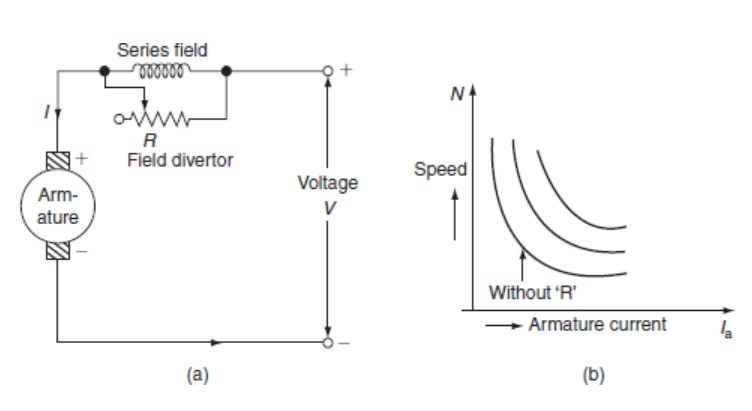 The arrangement of field diverter and speed-armature current characteristics is shown in the figure. In this method, Armature diverter is attached in parallel with armature winding of the motor. The arrangement of the parallel resistor and winding is shown in the figure. By the resistor across the armature, we can change in the flux produced. If the armature current is reduced due to diverter resistance then flux will be increased. So that, the motor reacts by drawing more current from the supply. So, the current through field winding increase, so the flux increases and the speed of the motor reduces. In this method, we control the speed of dc series motor by tapping on the series field winding. You will get the better idea by the figure shown below. Hence, by tapping we can select different no. of turns for field winding. Hence, flux produce will change and speed of the motor will also change. This method is generally used in DC traction motor. In this method of speed control, several speeds can be obtained by grouping the several field coils as shown in Figs. This method is used generally in case of fan motors. If the field coils are arranged in series, or parallel, the mmf produced by the coils changes; hence, the flux produced also changes. Hence, the speed is controlled. This method is one of most commonly employed method for control the speed of dc series motor. In this method, a variable resistor is attached in series with the armature. The arrangement and speed-current characteristics is shown in the figure. By the change in the resistance value, a voltage drop across the resistor will change. So the for the applied voltage, voltage across the armature will also change. Speed of the dc series motor is directly proportional to the applied voltage across the armature. 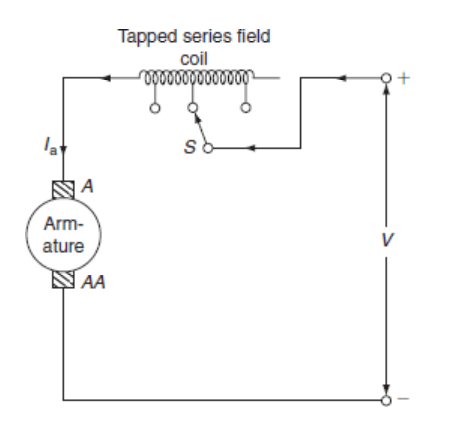 By increase in the series resistance value, a voltage drop will increase. Hence, the voltage applied to the armature will decrease and speed reduces. Armature resistance control is restricted to keep the speed below the normal speed of the motor and increase in the speed above the normal level is not possible by this method. For a given value of variable resistance, the speed reduction is not constant but varies with the motor load. This type of speed control method is used only for small motors. In this article, we saw different methods for controlling the speed of dc series motor. There are mainly two ways to control the dc series motor speed. By change in flux produced or by the change in armature resistance, we can easily able to change the speed of dc motor. We already saw in depth for every method for control the speed of dc series motor. If you have any doubt related to these methods then feel free to ask in the comment section.